If you do a general internet search say for preferred chinook salmon temperatures, you'll get a range across the board. Some mention a 54 degree temperature, while others state 44 degrees. That's a big difference! I'm in the 55 degree camp, but from things I have learned is that Alewifes are the favorite forage of Salmon and the alewife like 45-55 degree water temperature and the salmon go were the alewife are....So which is it? I think 55 degree may be the best temperature for both the salmon and the alewife. Lately, I've fished in the 45-55 degree range and had good luck with the salmon from montrose harbor and have observed the alewife in the area. One curious thing I've come across is that when I see alewife in the area, I catch no salmon. When alewife are not in the area, I catch salmon using shrimp? I also try to catch some alewife for my hook set in the process in hopes of luring a salmon to hit my line. In the world of fishing, I think the fish you catch pick YOU! Best4Now, pmjasper is talking about trolling, not fishing from shore. PMJ, the rule of thumb is that the thermo sets up at 53 degree water. Bait swims in that thermo and the Kings sit below. Last year was a tad different where we found a few Kings above it. Of course, Steelhead love warmer water and eat bugs. They like water temp changes on the surface that create a scum line. This is where the bugs hang in that aspect. You are correct, but in pmjasper's post, he did not mention anything about trolling, but its good enough for me too, so I thought maybe pmjasper's post was a general one asking for everyone's thoughts on temparature for salmon....like a general survey for people on the site and not just a survey for people with boats who are trollers...Also I fish on boats too, but I am not commenting on this post as an expert on trolling/boating or even fishing, just as another fisherman to another. Also, your tactics on temperature and salmon are sound and I agree with them.....I'm assuming that you know pmjasper and have a better sense of his question on temperature and salmon, and I appreciate your comments and post as I am a recent member on this web site. Sorry guys....no reason to get upset on this one. i should have clarified that i was referring to trolling, specifically during the summer months. Now my question with temp was regarding elimating water that just doesn't seem to hold fish. I know there are exceptions, particularly on the higher temp side, where fish will go and feed but are there any real exceptions on the low side (summer fishng)? In one of the fishing videos I purchased, which was produced on Lake Michigan and fairly recently, the captain stated that one of their most successful big king patterns is to troll a large 10-11 inch flasher and fly very deep during the mid-day hours. That got me thinking.....I would assume the captain is not putting that flasher and fly below the 42-44 degree "preferred" temperature for king salmon but I wanted to be sure. I guess in the end, I realize that fish will go out of their preferred temperature ranges to feed, usually into a higher temperature range than they "prefer" but if they "never" go below thier perferred temperature range, than I can eliminate a bunch of unproductive water right off the bat. Again, just speaking about summer fishing not the spring or fall. In my example from before, I fished last summer in a depth of 60 feet down over 130 feet deep. The temp at 60 feet deep was 42 degrees. Deeper than 60 feet the temperature dropped into the 30's. Therefore, I did not run my presentations deeper than 60 feet, assuming that no great concentrations of fish would be below that 60 foot depth due to the temperature. Thanks for the chart Marc. I very seldom fish down at deep cold temps and the 44 degree "avoidance' for Chinooks makes me feel more confident although I have caught Kings at 42-44. Interesting to note the "upper avoidance" of 60 degrees also for Kings- there was a period of hot bites for me at exactly 59 degrees. Personally, I may just try the 47 degree range- optimum for Haddock- love Haddock! btw- a good chart for all inland fish too! Best4Now, welcome to the site. Midsummer shore tactics are a tad different when it comes to temps. West West West Winds will bring cooler water this side and guys caught fish in 60+ water but they are few and far inbetween. Late summer, kings will make false runs an temps do not matter. Pmjasper, The 11 inch paddle with a 20lb ridgeback rattler in 300fow has been doing wonders deep on the other side of the lake. A wise man told me that the big kings are big for a reason and they usually have different patterns they follow. The Milwaukee Brew City Tournamnet this year, the guys that pulled the big kings were bunkered in a hole within two hills. Sun come come up, they move deeper or on the other side of the hill. I hear ya Joel but in that hole will they ever fish below 40 degree temps or will they simply look for bottom structure where that 42,44,46 degrees intersect? My thing is, if I don't necessarily see fish on the fishfinder but think it's a good idea to troll deep should i eve go into temps below 40 degrees? In what I have researched so far...it appears the answer is no but I'm just trying to get a better understanding of temperature and how it may determine where fish will and won't be. Rumor has it that the Kings go to the middle of the Lake in winter. Ask hightech, he was going to venture out there this winter. I have yet to fish below 40 degrees. I think my hunch is correct. I mention summer fishing because i realize that there are times such as early spring or perhaps late fall that those optimal temps may be harder to locate and thus fish may have to venture out of their comfort zones. For example...i have been told spring coho or brown trout will utilize the warmest water they can find in early spring.....it may not be in their comfort range, but it's the warmest they can find. That being said, I'm interested in summer fishing when waters both above and below peak temps are available to kings...would they ever stray below their preferred temps. we know they will go above their preferred temps to feed but below???? From what I can find, I don't think their is a viable population that would be worth fishing below the 40 degree mark. However, I also remember In-Fisherman doing an article on a charter captain that fished 300ft deep on Lake Ontario to catch big kings. Was he fishing in temps below 40 degrees???? I have to see if i can find the article or the captain's info. Actually, the captain's name is Mark Chmura and he fishes Lake Michigan. He's fishing depths of 300', 400' and deeper. Now I'm not saying we sxhould all scrap the temperature charts but this guy is catching mature kings way below their "preferred" temperature range. It just makes you wonder. UGH! Too much thinking during the off season. I would love to head out there but I would really need super calm seas and a buddy boat. When I took the trip in September to the IL, MI state line the further I got off shore the more fish I marked. Now I don't have a lot of experience on the lake like some of the other guys that have been fishing it for 10+ years so this is just what I think. This is only my third season chasing salmon but I am hooked and tend to over research things so this is all based off things I have read and experienced over a short period of time so any other info, or opinions are welcome. There are millions of fish in the lake and they have to be somewhere. I think in the winter all the larger cohos, kings and steelys head offshore because the water is more stable and the food must be more plentiful. It just seems like we only generally see the fish twice in their life time. Once when they are 2-5lbs and when they are coming back to spawn. In the ocean they travel a huge distance (see below map). their migratory pattern is similar year to year but what does it look like in the great lakes? I read a article from in-fisherman http://www.in-fisherman.com/print/3765 on kings at depths over 500 feet. I have been out in 300fow and have seen fish swim out off the bottom up 50+ feet on the graph in a matter of seconds. Originally I just assumed it was lakers but after reading this Article my mind has changed. This time of year I catch a lot of small kings(1-3lbs) but the larger ones are few and far between. I don't think I have ever gone out over 10 miles and not had great fishing. Fishing offshore does take some hunting but once you find them its game on. 15 miles+ is defiantly great fishing and you can catch just about anything except I have never caught a brown out that deep. 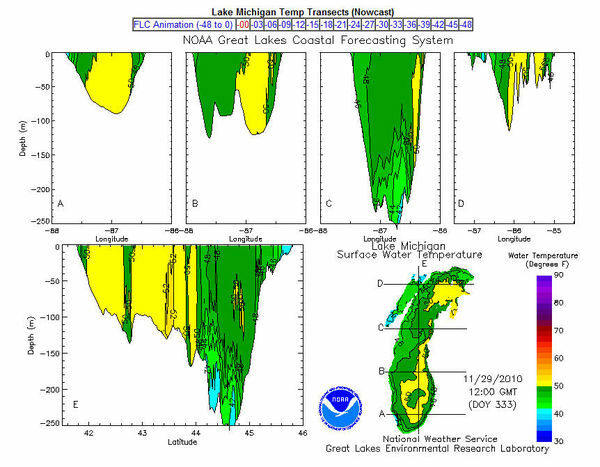 A interesting thing that has been discussed recently is the "doughnut" in southern lake michigan http://www.sciencedaily.com/releases/20 ... 210420.htm. I tried to see why the doughnut is where it is and found there is a reef that goes from Milwaukee to Muskegon that separates the lakes north and south rotation http://en.wikipedia.org/wiki/Lake_Michigan. I would love to take a trip from Milwaukee to Muskegon trolling. I have also seen when out 10-15 miles a plume of plankton that moved from about 30' down to 60' down during the course of a day in the same general area. The fish also moved up and down with this plume but the thermalcline stayed stable at about 40-50fow which was very intresting to me as I thought the plume stayed in the thermalcline. THis summer I also caught most of my fish in the summer in temps above 55-60 degrees. Kings, steelys, cohos, and lakers. The bait off shore also seemed to be high up in the water column from 20-30 foot down well above the thermalcline and in temps 65-70ish. Sometimes I wish I ate fish because I never keep them so don't get to see what they have been eating. I pulled quite a few kings in 65+ degree water out deep. My best rod this summer was a 5 color lead with a riverside stripper spoon. I have read that Alwives tend to not fight currents and just go with the flow which may mean they just swim round and round in the doughnut and the salmon likely follow or may just hang out and wait for the next bait ball to pass over. As for winter. I really want to head out once the lake flips back over and the warm water is back on the surface to fish the surface for whatever gets on the line. see below picture of the estimate for today on temps at depth. what happens in late fall is the warm surface water cools and ends up being cooler than the water beneath it causing the lake to flip and temps to be inconstant at depths so this I believe is why late fall fishing is so tough. Early this spring I ventured out in 35 degree water outa of indiana 12 miles out and did not mark anything down deep and the temp was 33 85 feet down but the water was very dirty so that was not very surprising but did manage to get a coho off the surface. The biggest problem with exploring out deep in the winter is most of the time conditions do not permit it. I have read a number of preferred temp ranges for different types of salmon from 43 to 47 for kings and 50-55 for cohos but I believe although that is where they feel the most comfortable that is not necessarily where they are the most active. What I don't understand is how are they the most active in 44 degree water if thats not where the bait is? Is it that they are running up and feeding for a few minutes then back down for a break and up and down..... I'm just thinking that if they are active maybe there is just a high concentration of kings at that depth because they go back down after feeding for a short time for a long break. The world may never know. Sorry this ended up being much longer than expected and it probably leaves more questions than answers. great info Brian loved the article, and as far a salmon fishing is concerned I've seen guy with 15-20 years experience that cant out fish you! HTR....read the same article and that's one of the things that got me wondering. Now while this isn't 400ft deep, last year while trolling my 42-46 degrees up in the 60ft range out over a depth of 130ft deep, I did mark fish down deep fairly close to the bottom. I figured they were lake trout and kept moving along but now this makes me wonder. Where they kings??? Should I drop a rod close to bottom during the mid-day hours I normally fish? Who knows. This is the stuff that runs through my head during the off season. Although it's good to have a game plan and to do some thinking in the off season, be careful to listen to the fish instead of telling them where they should be! On way to look at it instead of focusing in on a very narrow temperature range, I usually use general terms like "cool" and "warm." For example "...wind has been out of the west for a week, and the COOL water is near shore, so that's where I'll start fishing." But if I'm either not markin' or not catchin', guess what, I'm moving on! There's too many variables to focus ONLY on temperature. On the other hand, if I was going to look for one thing to try and find where the fish are, it would be bait. Yeah in reviewing the few months (July, August and early September) that I fished Lake Michigan, I think I relied too much on a thin temperature band. I mean most days out I took wave action, natural light penetration, speed and depth into consideration.....but I really relied on my Depth Raider to put me into a 42-46 degree band of water. Hey, we did OK. Maybe not gangbusters, but OK to start. I think now what I'm realizing is that fish relate to a much wider temperature than I thought based on other factors. My premises to fish over a certain depth or certain spread was still valid but I think next season I will not rely SO heavily on a "preferred" temperature. I just can't wait to get back out there and put all these things into perspective. Chitown-Angler was started on February 10, 2003 and has received 207381573 page views in total since that date.